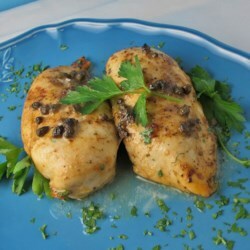 This melt in your mouth chicken dish can be served on a bed of rice pilaf. 2. 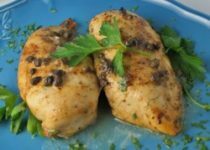 Arrange chicken in an oven proof clay pot or medium baking dish. Coat with lemon juice, and season with pepper. 3. In a small bowl, mix the melted butter, smoked garlic grilling sauce, 2 tbsp of diced scapes, and 2 tbsp of diced scape liquid. Reserve remaining diced scapes and liquid for another use. Pour butter mixture over the chicken to coat. 4. Cover and bake 25 minutes in the preheated oven, until chicken is no longer pink and juices run clear. Drizzle with remaining liquid from the baking dish to serve. This recipe requires a clay pot to turn out just right. Where can I buy your selection of products in Toronto? I can find the garlic steak splash and chicken lime splash when we visit our daughter. I would love to try other items. Candy, glad to hear you are enjoying the product. Visit us at http://www.thegarlicbox.com for locations near you (click on store locator link – top), or call us direct at The Garlic Box 519-262-2470. You can also sign up for our newsletter for online specials.